This article is about the medieval Irish text. For the album by Horslips, see The Book of Invasions (album). Lebor Gabála Érenn ("The Book of the Taking of Ireland") is a collection of poems and prose narratives that purports to be a history of Ireland and the Irish from the creation of the world to the Middle Ages. There are a number of versions, the earliest of which was compiled by an anonymous writer in the 11th century. It synthesized narratives that had been developing over the foregoing centuries. The Lebor Gabála tells of Ireland being settled (or 'taken') six times by six groups of people: the people of Cessair, the people of Partholón, the people of Nemed, the Fir Bolg, the Tuatha Dé Danann, and the Milesians. The first four groups are wiped out or forced to abandon the island, the fifth group represent Ireland's pagan gods, while the final group represent the Irish people (the Gaels). Today, most scholars regard the Lebor Gabála as primarily myth rather than history. It appears to be mostly based on medieval Christian pseudo-histories, but it also incorporates some of Ireland's native pagan mythology. Scholars believe the goal of its writers was to provide an epic history for Ireland that could compare to that of the Israelites or the Romans, and which reconciled native myth with the Christian view of history. It is suggested, for example, that there are six 'takings' to match the "Six Ages of the World". Lebor Gabála Érenn is also considered a "highly influential Middle Irish prose-and-verse treatise [...] written in order to bridge the chasm between Christian world-chronology and the prehistory of Ireland". The Lebor Gabála is usually known in English as The Book of Invasions or The Book of Conquests, and in Modern Irish as Leabhar Gabhála Éireann or Leabhar Gabhála na hÉireann. It has been described as an attempt to provide the Irish with a written history comparable to that which the Israelites provided for themselves in the Old Testament. Drawing upon the pagan myths of Gaelic Ireland but reinterpreting them in the light of Judeo-Christian theology and historiography, it describes how the island was settled six times by six groups of people. Biblical paradigms provided the mythologers with ready-made stories which could be adapted to their purpose. Thus we find the ancestors of the Irish enslaved in a foreign land, or fleeing into exile, or wandering in the wilderness, or sighting the "Promised Land" from afar. The authors of Lebor Gabála Érenn were heavily influenced by other religious texts like St. Augustine of Hippo's 5th century book, City of God. The pre-Christian elements, however, were never entirely effaced. One of the poems in LGE, for instance, recounts how goddesses from among the Tuatha Dé Danann took husbands from the Gaeil when they 'invaded' and 'colonised' Ireland. Furthermore, the pattern of successive invasions which LGE preserves is reminiscent of Timagenes of Alexandria's account of the origins of the Gauls of continental Europe. Cited by the 4th-century historian Ammianus Marcellinus, Timagenes (1st century BC) describes how the ancestors of the Gauls were driven from their native lands in eastern Europe by a succession of wars and floods. The Tochomladh was an Immigration or arrival of a Colony; and under this name the coming of the several colonies of Parthalon of Nemedh, of the Firbolgs, the Tuatha Dé Danann, the Milesians, etc., into Erinn, are all described in separate tales. It is probably from the original records of these ancient stories that the early part of the various Books of Invasions has been compiled. 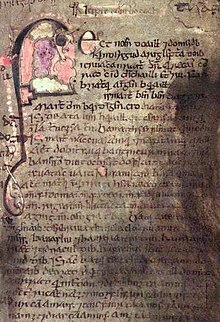 The earliest extant account of the purported history of Ireland is to be found in the Historia Brittonum or "History of the Britons," which was once thought to have been written by the Welsh priest Nennius in 829–830. This text gives two separate accounts of early Irish history. The first consists of a series of successive colonisations from Iberia by the pre-Gaelic peoples of Ireland, all of which found their way into LGE. The second recounts the origins of the Gaeil themselves, and tells how they in turn came to be the masters of the country and 'ancestors' of all the Irish. It was late in the 11th century that a single anonymous scholar appears to have brought together these and numerous other poems and fitted them into an elaborate prose framework – partly of his own composition and partly drawn from older, no longer extant sources (i.e. the tochomlaidh referred to above by O'Curry), paraphrasing and enlarging the verse. The result was the earliest version of LGE. It was written in Middle Irish, a form of Irish Gaelic used between 900 and 1200. First Redaction (R¹): preserved in The Book of Leinster (c. 1150) and The Book of Fermoy (1373). Míniugud (Min): this recension is closely related to the Second Redaction. It is probably older than the surviving MSS of that redaction, though not older than the now lost exemplar on which those MSS were based. The surviving sources are suffixed to copies of the Second Redaction. 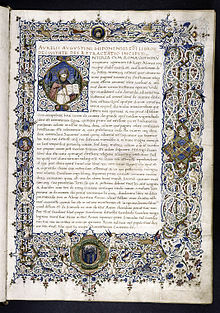 Second Redaction (R²): survives in no less than seven separate texts, the best known of which is The Great Book of Lecan (1418). Third Redaction (R³): preserved in both The Book of Ballymote (1391) and The Great Book of Lecan. O'Clery's Redaction (K): written in 1631 by Mícheál Ó Cléirigh, a Franciscan scribe and one of the Four Masters. Unlike the earlier versions of LGE, this redaction is in Early Modern Irish but was admitted as an independent redaction by Macalister because there are indications that the author had access to sources which are no longer extant and which were not used by the compilers of the other four redactions. The work was compiled in the convent of Lisgool, near Enniskillen. O'Clery was assisted by Gillapatrick O'Luinin and Peregrine O'Clery (Michael O Clery's third cousin once removed, and one of the Four Masters). K is contained in several paper manuscripts, but K¹, the "authoritative autograph", takes precedence. For many centuries LGE was accepted without question as an accurate and reliable account of the history of Ireland. As late as the 17th century, Geoffrey Keating drew on it while writing his history of Ireland, Foras Feasa ar Éirinn, and it was also used extensively by the authors of the Annals of the Four Masters. Recently, however, the work has been subjected to greater critical scrutiny. One contemporary scholar has placed it in "the tradition of historical fabrication or pseudohistory"; another has written of its "generally spurious character" and has drawn attention to its many "fictions", while acknowledging that it "embodies some popular traditions. The Irish archaeologist R. A. Stewart Macalister, who translated the work into English, was particularly dismissive of it: "There is not a single element of genuine historical detail, in the strict sense of the word, anywhere in the whole compilation". Macalister later softened his opinion. While most scholars view the work as primarily myth rather than history, some have argued that it is loosely based on real events. In the 1940s, T. F. O'Rahilly created a model of Irish prehistory based on his analysis of LGE and the early Irish language. He suggested that there were four waves of Celtic migrations or invasions: that of the Cruthin or Pritani (c. 700–500 BC), the Builg or Érainn (c. 500 BC), the Laigin, Domnainn and Gálioin (c. 300 BC), and the Gaels (c. 100 BC). He argues that some of the 'invasions' depicted in LGE are based on these, but that others were invented by the writers. He also argues that many of Ireland's 'pre-Gaelic' peoples continued to flourish for centuries after 100 BC. In The White Goddess (1948), British poet and mythologist Robert Graves argued that myths brought to Ireland centuries before the introduction of writing were preserved and transmitted accurately by word of mouth before being written down in the Christian Era. Taking issue with Macalister, with whom he corresponded on this and other matters, he declared some of LGE's traditions "archaeologically plausible". The White Goddess itself has been the subject of much criticism by archeologists and historians. LGE was translated into French in 1884. The first complete English translation was made by R. A. Stewart Macalister between 1937 and 1942. It was accompanied by an apparatus criticus, Macalister's own notes and an introduction, in which he made clear his own view that LGE was a conflation of two originally independent works: a History of the Gaedil, modelled after the history of the Israelites as set forth in the Old Testament, and an account of several pre-Gaelic settlements of Ireland (to the historicity of which Macalister gave very little credence). The latter was then inserted into the middle of the other work, interrupting it at a crucial point of the narrative. Macalister theorised that the quasi-Biblical text had been a scholarly Latin work entitled Liber Occupationis Hiberniae ("The Book of the Taking of Ireland"), thus explaining why the Middle Irish title of LGE refers to only one "taking", while the text recounts more than half a dozen. A retelling of the familiar Judeo-Christian story of the creation, the fall of Man and the early history of the world. In addition to Genesis, the author draws upon several recondite works for many of his details (e.g. the Syriac Cave of Treasures), as well as the four Christian works mentioned earlier (i.e. The City of God, etc.). This chapter explains, and is based on, the belief that all mankind is descended from Adam through the sons of Noah. It tells us how Noah's son Japheth is the forebear of all Europeans (see Japhetites), how Japheth's son Magog is the forebear of the Gaels and Scythians, and how Fénius Farsaid is the forebear of the Gaels. Fénius, a prince of Scythia, is described as one of 72 chieftains who built the Tower of Babel. His son Nel weds Scota, daughter of an Egyptian pharaoh, and they have a son named Goídel Glas. Goídel crafts the Goidelic (Gaelic) language from the original 72 languages that arose after the confusion of tongues. Goídel's offspring, the Goidels (Gaels), leave Egypt at the same time as the Israelites (the Exodus) and settle in Scythia. After some time they leave Scythia and spend 440 years wandering the Earth, undergoing a series of trials and tribulations akin to those of the Israelites, who spent 40 years wandering in the wilderness. After many years at sea, they settle in the Maeotian marshes, then sail via Crete and Sicily and conquer Iberia. There, Goídel's descendant Breogán founds a city called Brigantia, and builds a tower from the top of which his son Íth glimpses Ireland. It appears that this chapter was meant to give the Gaels a genealogy which links them to key Biblical figures and conforms to Judeo-Christian beliefs. It links them to events from the Old Testament and likens them to the Israelites. The claim of Scythian origins seems to be based on the similarity of the names Scoti and Scythae. Other medieval pseudo-historians did likewise with other nations. For example, in his earlier History of the Goths, Isidore concludes that the Goths and Gets are related due to their similar names, and says that they (along with the Scythians) descend from Magog. The claim of Iberian origins may be based on three things: the similarity of the names Iberia and Hibernia, Isidore describing Iberia as the "mother[land] of the races", and Orosius describing Ireland as lying "between Iberia and Britain". The claim that the Gaels settled in the Maeotian marshes seems to have been taken from the Book of the History of the Franks, and their travels to Crete and Sicily may have been based on the tale of Aeneas. Brigantia refers to Corunna in Galicia (which was then known as Brigantium) and Breogán's tower is likely based on the Tower of Hercules, which was built at Corunna by the Romans. According to LGE, the first people to arrive in Ireland are led by Cessair, daughter of Bith, son of Noah. They are told to go to the western edge of the world to escape the oncoming Flood. They set out in three ships but when they land in Ireland, forty days before the Flood, two of the ships are lost. The only survivors are Cessair, forty-nine other women, and three men: Fintan mac Bóchra, Bith and Ladra. The women are split evenly among the men. Each also takes one as his wife: Fintán takes Cessair, Bith takes Barrfhind and Ladra takes Alba. However, Bith and Ladra soon die and Ladra is the first man buried in Ireland. When the Flood comes, Fintán is the only one to survive. He becomes a salmon and later an eagle and a hawk, living for 5,500 years after the Flood, whence he becomes a man again and recounts Ireland's history. In an earlier version of the tale, the first woman in Ireland is Banba. Banba, Fódla and Ériu were a trio of land goddesses and their husbands were Mac Cuill (son of hazel), Mac Cecht (son of the plough) and Mac Gréine (son of the Sun). It is likely that Cessair, the three men and their three wives are a Christianized replacement for them. Fintán/Mac Cuill may also be linked to the Salmon of Knowledge, which gains all the world's knowledge after eating nine hazelnuts that fall into a well. The women who accompany Cessair appear by their names to represent the world's ancestral mothers; they included Alba (ancestor of the Britons), Espa (Spanish), German (Germans), Gothiam (Goths), Traige (Thracians), and so forth. Thus "their arrival can be read as creating a microcosm of the whole world's population in Ireland". Several other companions echo the names of ancient Irish goddesses. Ireland is then uninhabited for 300 years, until a second group of people arrive. They are led by Partholón, who is descended from Noah through Magog. They sail to Ireland via Gothia, Anatolia, Greece, Sicily and Iberia. They include Partholón’s wife Delgnat, their four chieftain sons, and others. When they arrive, there is only one open plain, three lakes and nine rivers. They clear four more plains and a further seven lakes burst from the ground. Named figures are credited with introducing cattle husbandry, ploughing, cooking, dwellings, trade, and dividing the island in four. They battle and defeat the mysterious Fomorians, who are led by Cichol Gricenchos. Eventually, Partholón and his people (now 5,000 men and 4,000 women) die of plague in a single week. Only one man, Tuan mac Cairill, survives. Like Fintán, he lives for centuries in a number of forms, so that he can recount Irish history. This chapter also includes the tale of Delgnat committing adultery with a servant. Partholón comes from Bartholomaeus (Bartholomew) and he is likely an invention of the Christian writers, possibly being borrowed from a character of that name in the Christian pseudo-histories of Saint Jerome and Isidore. The Fomorians have been interpreted as a group of deities who represent the harmful or destructive powers of nature; personifications of chaos, darkness, death, blight and drought. Ireland is then uninhabited for 30 years, until a third group of people arrive. They are led by Nemed, who is also descended from Noah through Magog. They set out from the Caspian Sea in 44 ships but, after a year and a half of sailing, the only ship to reach Ireland is Nemed's. On board are his wife, his four chieftain sons, and others. During their time in Ireland, the Nemedians clear twelve plains and build two royal forts, and four lakes burst from the ground. They win four battles against the Fomorians. After Nemed and many others die of plague, the Nemedians are oppressed by the Fomorians Conand and Morc. Each Samhain, they must give two thirds of their children, their corn and their milk to the Fomorians. This tribute that the Nemedians are forced to pay may be "a dim memory of sacrifice offered at the beginning of winter, when the powers of darkness and blight are in the ascendant". Eventually, they rise up against the Fomorians and attack the Tower of Conand with 60,000 warriors (30,000 on sea and 30,000 on land), defeating Conand. Morc then attacks, and almost all of the Nemedians are killed in a tidal wave. Only one ship of thirty men escapes. Some of them go "into the north of the world", some go to Britain and become the ancestors of all Britons, and some go south to Greece. Those who went into the north of the world are the supernaturally-gifted Tuatha Dé Danann (or Tuath Dé), who represent the main pagan gods of Ireland. They come to Ireland in dark clouds and land on Sliabh an Iarainn in the west. They fight the Fir Bolg for the ownership of Ireland in the First Battle of Mag Tuired (Moytura). The Tuath Dé are victorious. They offer the Fir Bolg a province of Ireland, and they choose Connacht. Nuada, king of the Tuath Dé, loses his hand or arm in the battle and is thus no longer fit to be their king. He is replaced by Bres (a half-Fomorian), who becomes High King of Ireland. However, Bres mistreats the Tuath Dé and neglects his kingly duties. This may reflect the occasional supremacy of the powers of blight (the Fomorians) over the powers of growth (the Tuath Dé). After seven years, Dian Cecht the physician and Credne the metalsmith replace Nuada's hand/arm with a working silver one, and he re-takes the kingship. The Tuath Dé then fight the Fomorians in the Second Battle of Moytura. Balor the Fomorian kills Nuada, but Balor's (half-Fomorian) grandson Lugh kills him and becomes king. The Tuatha Dé enjoy 150 years of unbroken rule. Modelled on the Biblical Books of Kings, this book recounts the deeds of various kings of Ireland, most of them legendary or semi-legendary, from the time of Éber and Érimón to the early 5th century of the Christian era. A continuation of the previous book. This book is the most accurate part of LGE, being concerned with historical kings of Ireland whose deeds and dates are preserved in contemporary written records. ^ Koch 2006, pp. 1693-1695. ^ Carey 1994, pp. 1–4. ^ Carey 1994, pp. 1-4. ^ a b Koch 2006, p. 1132. ^ Carey 1994, pp. 1–4, 24. ^ a b Koch 2006, p. 1130. ^ Macalister 1938, pp.xxvi-xxvii: "If we cut the interpolated sections out, we find ourselves left with a History of the Gaedil, based upon the history of the Children of Israel as it is set forth in the Old Testament.". ^ According to (O'Donovan 1849, pp. xxiii–xxiv) the manuscript K1 in the Royal Irish Academy is actually a fair copy of Mícheál Ó Cléirigh's autograph made by his fellow-master Peregrine O'Clery. The author's original manuscript was probably sent to Louvain. ^ John Carey, in an introduction to the 1993 edition of R. A. Stewart Macalister's English translation; Francis John Byrne, in his Irish Kings and High-Kings (pp. 9–10) refers to the work as "a fantastic compound of genuine racial memories, exotic Latin learning and world history derived from Orosius and Isidore of Seville, euhemerised Celtic mythology, dynastic propaganda, folklore, and pure fiction". ^ O'Rahilly 1946, p. 264. ^ Macalister 1939, p. 252. ^ O'Rahilly 1946, p.264; pp. 154 ff. ^ Graves 1948, p.48 & p.100. ^ Macalister 1939, pp. 33-39; 61-65. ^ Carey 1994, p. 3. ^ Koch 2006, p. 1133. ^ a b Carey 1994, p. 12. ^ Carey 1994, p. 13. ^ Carey 1994, p. 15. ^ Carey 1994, p. 16. ^ Koch 2006, p. 165. ^ Carey 1994, p. 21. ^ a b Carey 1994, p. 9. ^ MacCulloch 2009, pp. 80, 89, 91. ^ MacCulloch 2009, p. 80. ^ MacCulloch 2009, p. 89. Robert Alexander Stewart Macalister's five volume English translation of Lebor Gabála Érenn was published between 1938 and 1956. Online Index to the Lebor Gabála Érenn (Book of Invasions) based on R.A.S. Macalister's translations and notes, CELT. Lebor Gabála Érenn, Books 1–8, Mary Jones' Celtic Literature Collective. Book of Invasions, Timeless Myths.